The translation of the Rundschau system shown here derives from Zuschnitt XVI dating from circa 1959. The Rundschau system has evolved significantly since that time, and those who wish to use the modern version will need to purchase it from the Müller and Sons website. 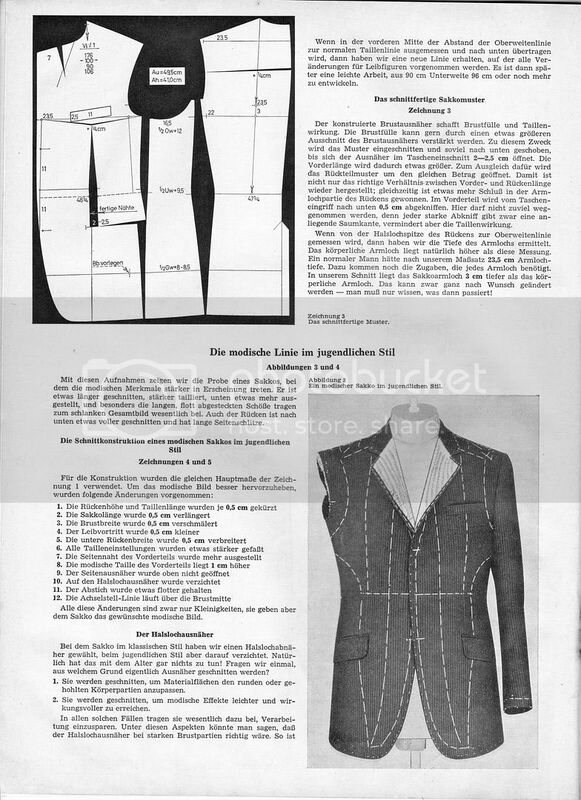 If you found this draft to be useful, it is strongly recommended that you subscribe to Rundschau as it is the last classic tailoring journal still in print. This thread should help you follow most Rundschau drafts even if you do not read German well. It is only available in German. No English translation is available. However, if you absorb the content of this thread fully, you should be able to follow it without being able to read the text. These books tend to be available only for a limited time. A second companion to this first volume is expected at any time. They also have a CAD version of their modern system, although this is more for industry cutters. Unfortunately, none of the men's cutting books are in English, although they do offer an English version of their women's cutting book. However, once you are familiar with their system you may be able to follow the drafts without being able to read German. 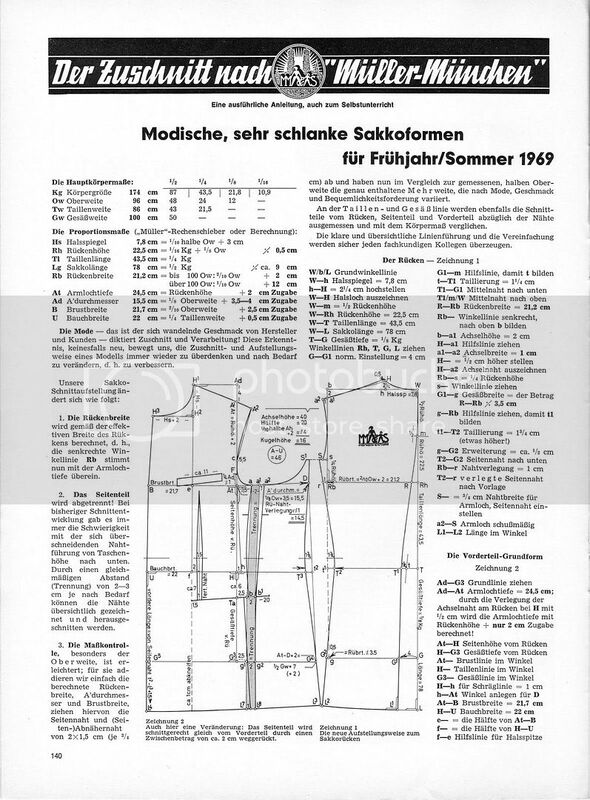 For a thread on how to read Rundschau drafts without by just looking at the diagrams please see this detailed thread. You will be able to apply this to the latest patterns printed in the journal. Those of you interested in the 1960s version of the ladies' Rundschau system should see this thread. This thread also contains detailed information on how to take a whole series of supplementary measures and how to use them as check measures alongside the calculated proportionate measures. h. = half ("halb" in German) eg "h. Kg" means "1/2 the height"
1. Start by drafting a vertical line down from point W.
3. m is ½ from W to Rh. 4. G is 1/8 of Kg down from T.
6. h to W is your back neck measure. 8. g to G1 is 4cm. 9. 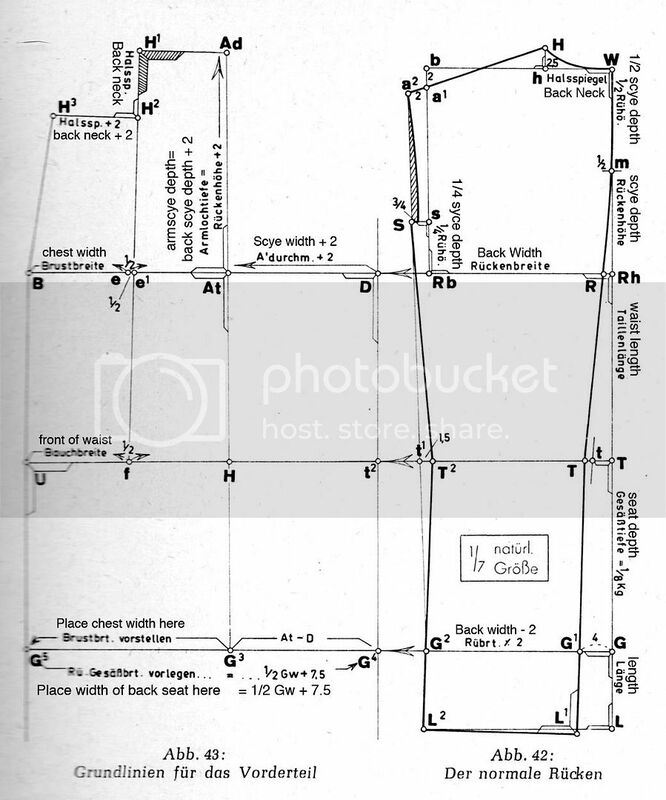 Draw line from m to G1, marking R on the scye line and t on the waist line. 10. t to T1 is 1cm. 11. From R measure Rb (width of back) to the left. 12. Square up perpendicularly from Rb to b to the neck line. 13. Divide Rb to b into quarters. Mark the first ¼ as s.
16. G1 to G2 is your back width – 2cm. 17. Draw line connecting a2 and G2, creating S and t1. 18. t1 to T2 is 1,5cm. 19. Connect S with T2,G2 and L2 (on the line from L in the back). 20. Place the L-square connecting G1 and L2, creating a right angle at L1. 21. Draw curved line to the point 3/4 cm inwards from S.
The back panel is now complete. 1. Extend the lines from the back further to the left, leaving an amount of space between them (around 7.5-10cm). 2. Square down from point D to find the points t2 and G4. 3. 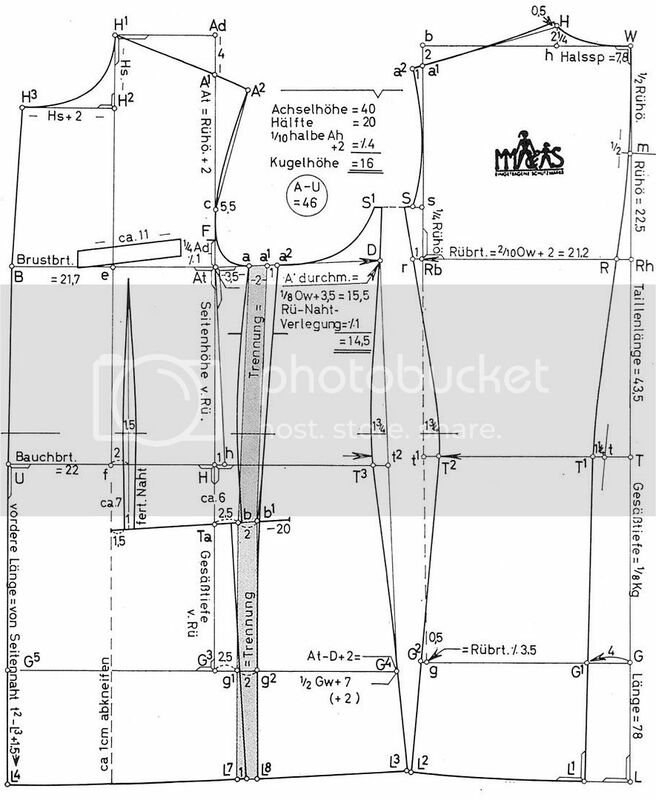 Measure Ad (armscye width) +2cm to find point At. 4. Square up and down from At creating points Ad (back scye depth +2cm), H and G3. 12. Square out to the left of Ad to find point H1. 19. Connect A2 and c.
21. Square down from At to h and then from At up along the line up to D.
26. t3 to U is your waistline. 28. T3 to L3 is equal to T2 to L2. Apply that length plus 1.5cm from U to L4. Connect L4 and L3. 29. H to Ta is 7.5cm for the depth of the side pocket. From there 6cm towards the back to find point b. 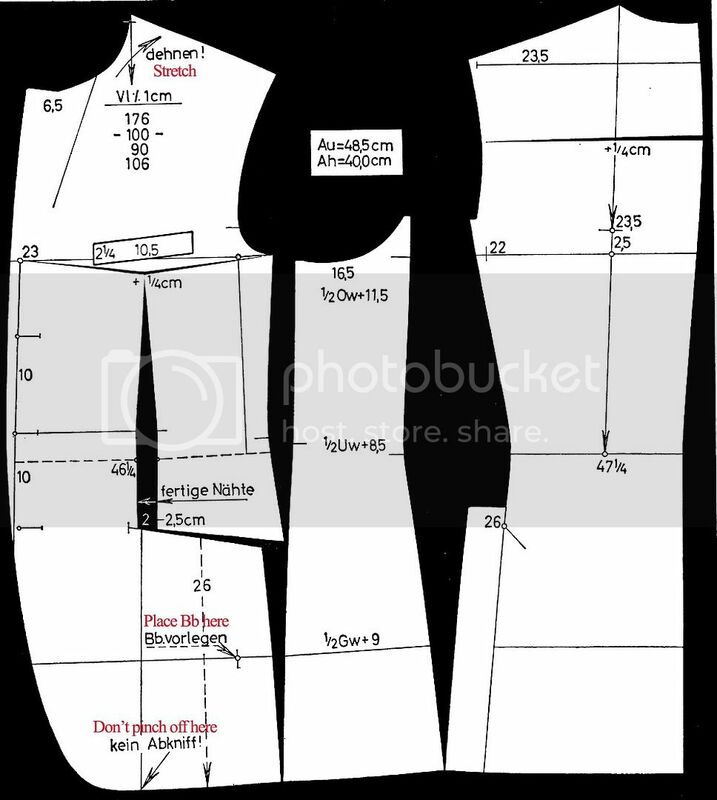 From b it is 18cm towards the front, with the pocket line being 8.5cm below f.
33. Connect a with b, and continue the line down to the hemline. 34. Draw line from a1 to find a point 6-7cm below the pocket. From this point add waist suppression by measuring in 1/2cm from each line inwards of the waistline (see diagram 47). 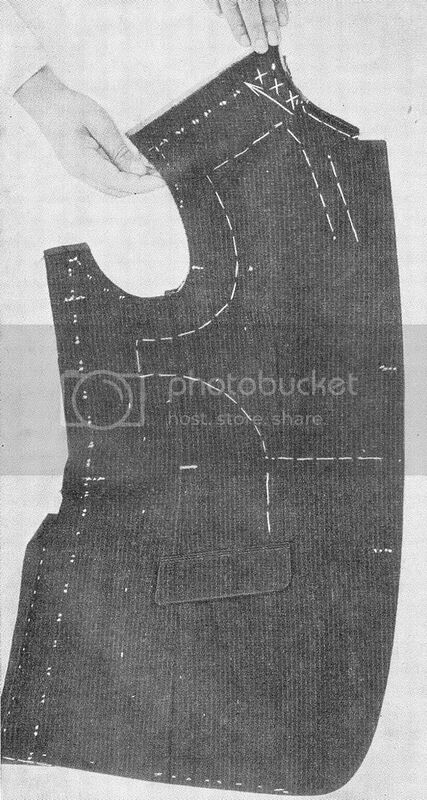 Then shape the side seam by connecting a and a1 with those points, and from there slight curve down to the point below the pocket. 35. Centre of front dart is 2cm from f, depth is 1.5cm. Shape as shown. 36. At to F is ¼ scye width minus 0.5cm. 38. Chest welt pocket is on a line 3cm below B to At. 39. Remove 1.5cm(front dart depth) on line from b to Ta, curve from that new point down. A seam allowance of 0.75cm is allowed for throughout, except on the front edge, centre back, neck hole, front dart and hem. 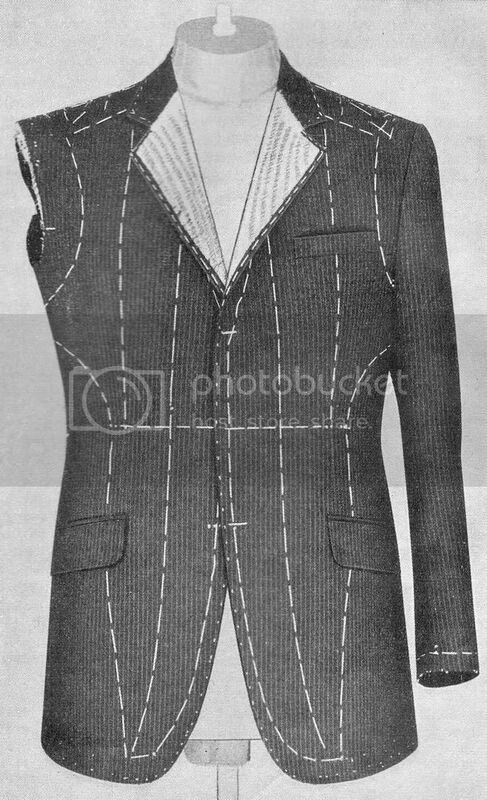 One issue I have noticed with the Rundschau system of this era is that the shoulder seam is a tiny bit slanted backwards on the bias. This is likely a relic from older version of the system, in which the seam was even more on the bias. I find it best to complete the pattern according to the above system, and then advance the back shoulder seam forward by 1.5-2cm or until it runs down the middle of the shoulder. The back neck will also have to be widened by 1-1.5cm (and the collar seam of foreparts reduced by the corresponding amount). 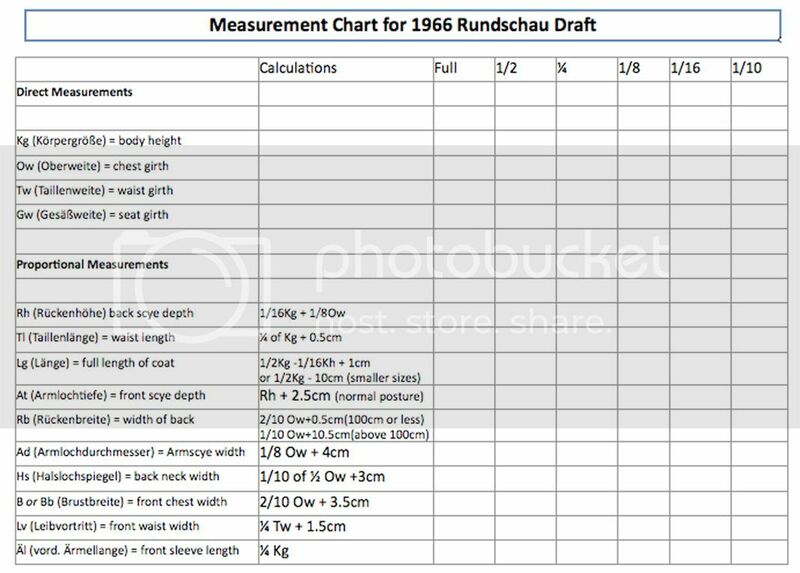 As it stands the above Rundschau draft will give you an approximately 7.8cm back neck, which is similar to the 3" back neck found in Edwardian era Cutter's Practical Guide systems. The modern back neck is typically wider than the narrower back neck of the 1950-60s, and results in a cleaner shoulder, as well as more forward pitch of the shoulder-armscye. 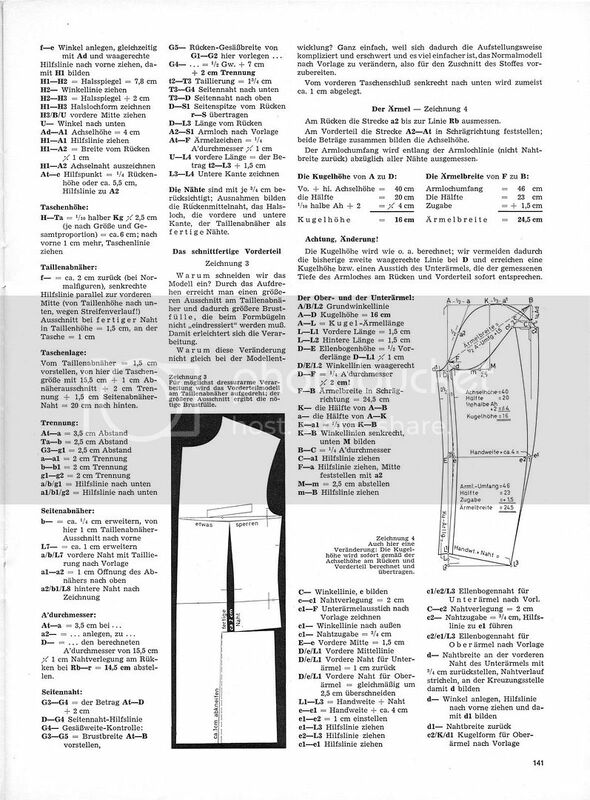 The Rundschau system from circa 1960 for cutting collars can be found in this thread. 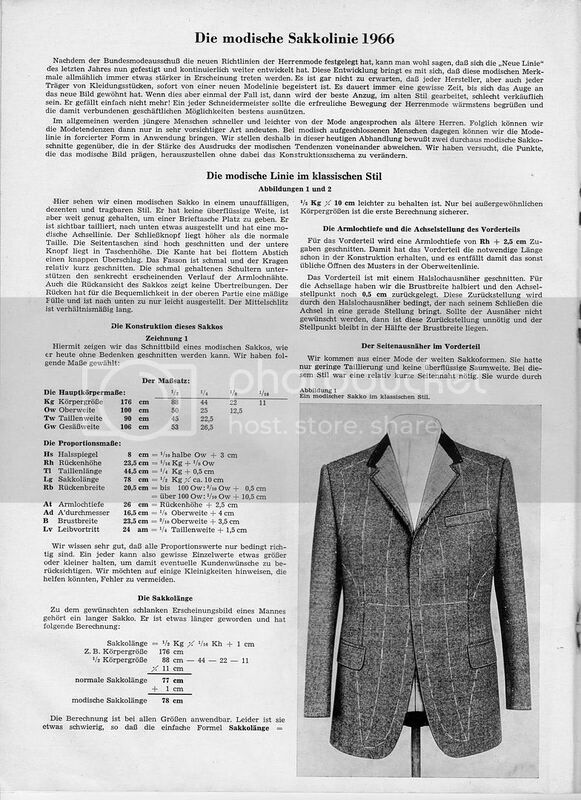 The corresponding Rundschau sleeve system from this era can be found pinned in this forum. 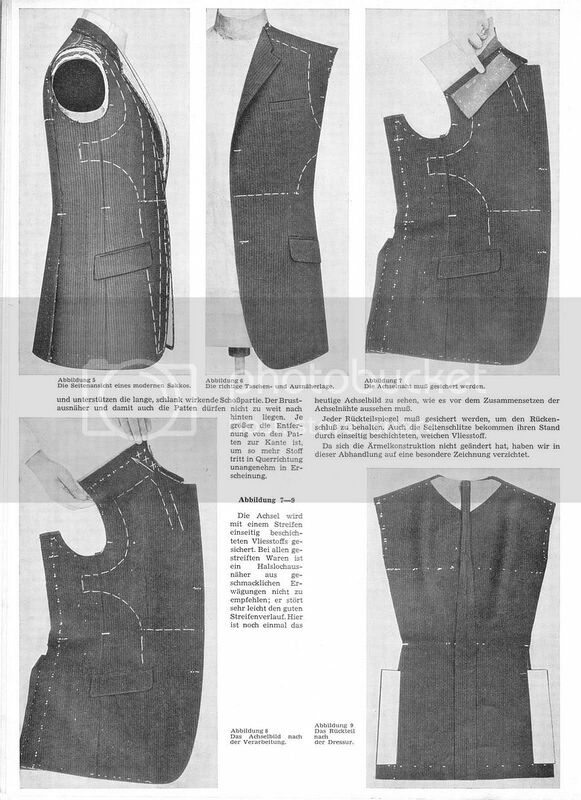 It contains information on cutting morning coats, dress coats and frock coats. BTW I would also like to say thank you to Schneidergott, on whose translation I based the above translation of the lounge coat system! The following is a 1966 version of the Rundschau lounge system. The sixties saw the Rundschau cutting system being further refined. In this edition of Rundschau from May, 1966, two different cuts are presented. The first is a Classic Button-Three Lounge Coat. The second draft is for a more fitted style of lounge coat for a younger figure. The cut has no excess drape but is yet easy enough to permit a wallet to be carried. There is clearly visible waist suppression, with subtle flare of the skirt, with a fashionable shoulder line. The buttoning is that of a modestly high button-three. The side pocket are cut a touch high with the bottom button set at the level of the pockets. The foreparts are cut-away. 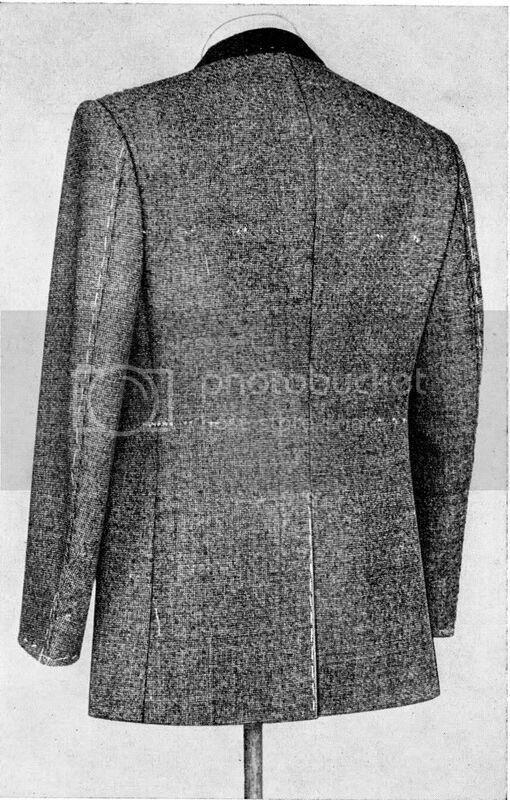 The lapels are narrow and the collar cut fairly short. The narrow shoulders are supported by a vertical run of the underarm seam. The is moderate drape (2.5cm) at the back to give comfort through ease, and again there is a bit of flare of the skirt. The centre back vent is relatively long. A comparison with the earlier version will show a number of changes. Note that instead of Uw they say Tw, and instead of Bau they say Lv. However, they mean exactly the same thing. These proportionate calculated values can be modified according to the needs of the figure and design. "1/10 h Kg" means 1/10th of half of Kg (height). The formula works for all sizes. It is however a bit complex. The usual formula of length = 1/2 Kg - 10 cm is easier. For unusually large sizes it is essential to do the calculations the long way. The front depth of scye is calculated as Rh + 2.5 cm. This gives the foreparts the necessary length. A gorge dart has been placed at the neck. To find the shoulder seam, take half the width of chest and displace the neckpoint a half cm backwards. When the gorge dart is closed the neckpoint will return to its correct position. We have just emerged out of a period in fashion where a very easy cut of lounge coat was popular with little waist suppression. For this style a relatively short underarm seam was necessary. This was achieved by a large removal of width at the underarm seam. 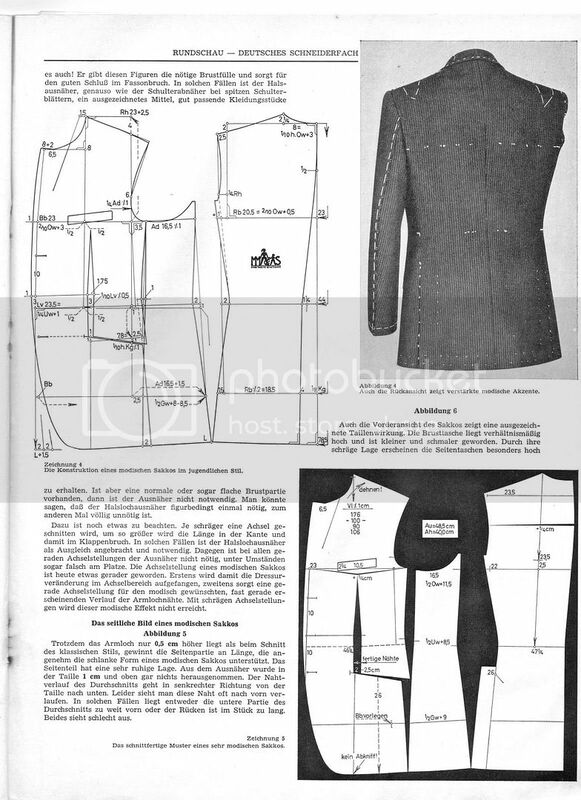 In those days, 2 cm was removed and the side body was work up into an angle by the iron, which only served to increase the amount that was being removed at the underarm seam. By contrast, the modern lounge coat has more clearly defined waist suppression, as well as more flare at the skirt. Greater waist suppression necessitates more length in the underarm seam. That means that much less has to be taken out at the underarm seam. In this case, only 1 cm has been taken out there. Even less, or none at all can be taken out if more pronounced waist suppression is desired. "Dehnen" means "stretch". Schoßlg and Schl are both abbreviations meaning skirt length. 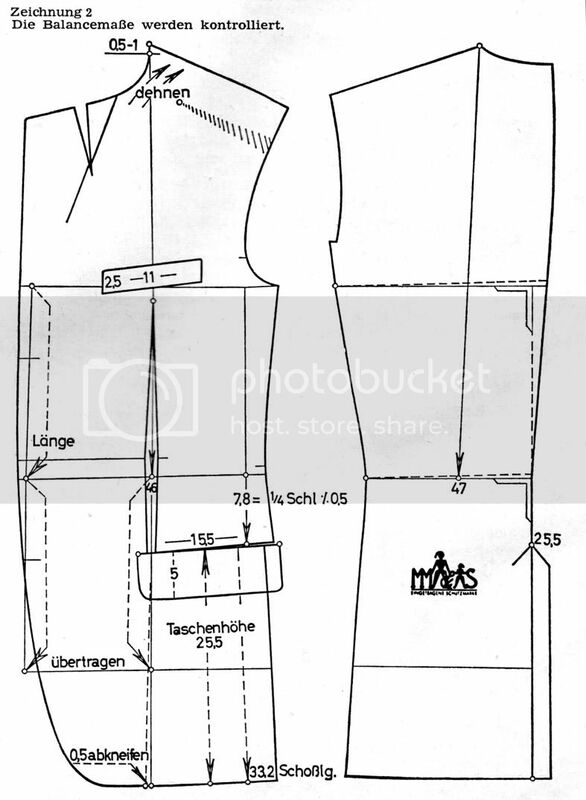 So pocket height is 1/4 skirt length minus 0.5cm Taschenhöhe means pocket height. Übertragen means to carry over the measures from above, as indicated by the arrows. The instruction 0,5 abkneifen means to pinch the draft here by 0.5cm. The 'd' in Ad has not printed properly and it looks like "Au". "Bb vorlegen" means "apply chest measure here". "Fertige Nähte" means completed seams. The final paper pattern is cut to give more waist suppression and chest effect. The overpocket section is allow to swivel out by 2-2.5cm. This will crooken the cut and throw a little extra length to the front. To compensate a cut is made in the back to increase the back balance by 1/4 cm. A cut running from the front of side pocket down to the hem is pinched off by 0.5cm to open up a wedge at the pocket. This amount should be kept to a minimum as otherwise it will start to interfere with the waist suppression. The measurements are the same as before. The reason for eliminating this is as follows and has nothing to do with age. It is only necessary for a prominent chested figure. For a normal or a flat chested figure it is not necessary. When the cloth has stripes in it, it is particularly important to avoid the gorge dart as this makes the stripes run more on the bias at the front shoulder, and it is important to avoid crookening the neckpoint with the gorge dart to preserve the straightness in the cut. The higher armscye makes the underarm seam longer and enhances the elongating effect of the fashionable cut. The front edge of the side body at the underarm seam is kept straight. It should not be allowed to angle forwards, as often is seen. If this is allowed to happen the lower section of the side body will sit to far forwards or the back part of the side body will be too long. Both look equally bad. From the front the enhanced waist suppression on the coat is clearly visible. The chest pocket is a little higher as well as smaller and narrower. The angled side pockets make them look even higher, and complement the longer, slimmer skirt. The front dart should not be placed too far back so that the pocket flaps don't lie too far back. Is the effective width of back placed R-Rb. Rb is at the same depth as the depth of scye. Previously, the side body was drafted so that its seams overlapped with that of the forepart from side pocket level downwards, creating some difficulties. The side body is now drafted with a separation of 2-3cm from the forepart so that the side body can be easily cut out. 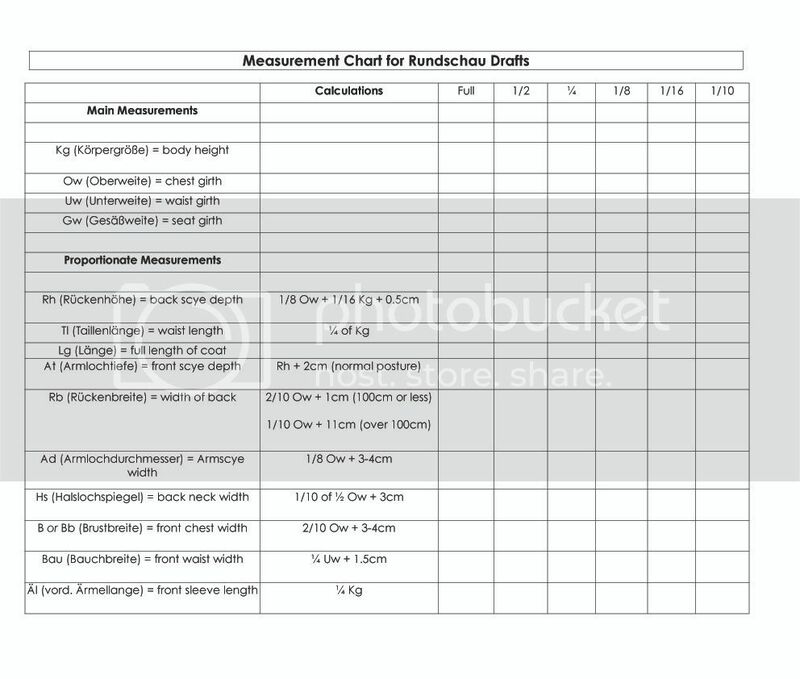 Proofing the measurments is made easier, especially for chest measures. 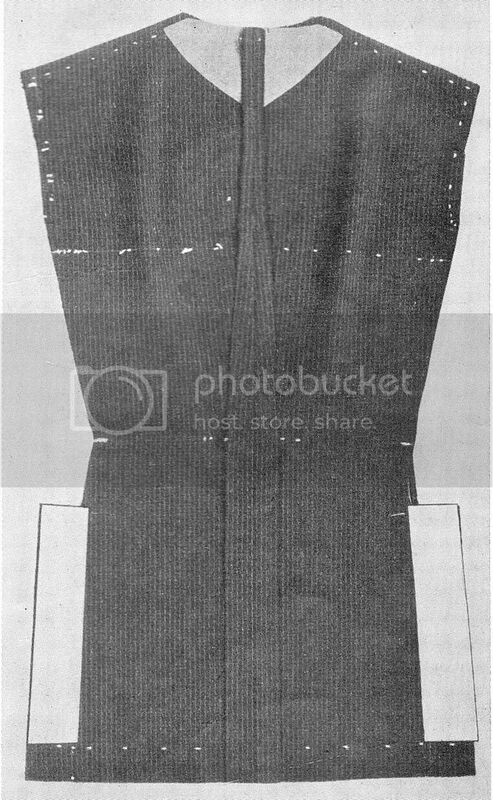 Just add up the widths of back, armscye diameter and width of chest and then subtract the seam allowances (2 x 1.5 cm, each seam being 0.75cm) and extra gaps. This yields the half chest measure plus the chest ease, which can be further adjusted to taste. 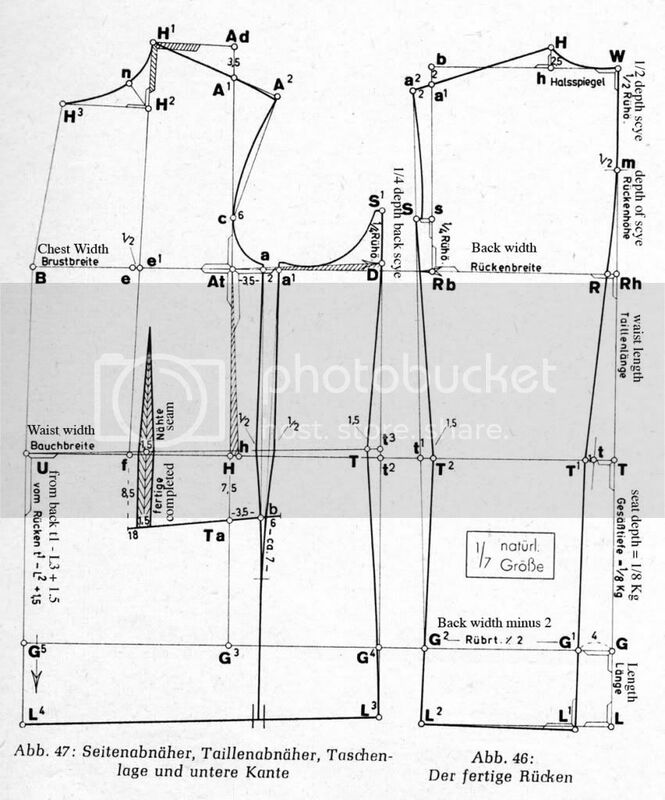 The measure at the waist and seat can similarly be proofed by adding the widths of back, side body and back together, less the seam allowances, then comparing them to the body surface measurements. The improvement in the ease and clarity should win over every experienced cutter. Due to the displacement of the back neck point at H by 0.5 cm. The front depth of scye is calculated by adding only 2cm to the back depth of scye. Go forward 1.5 cm from the front dart. 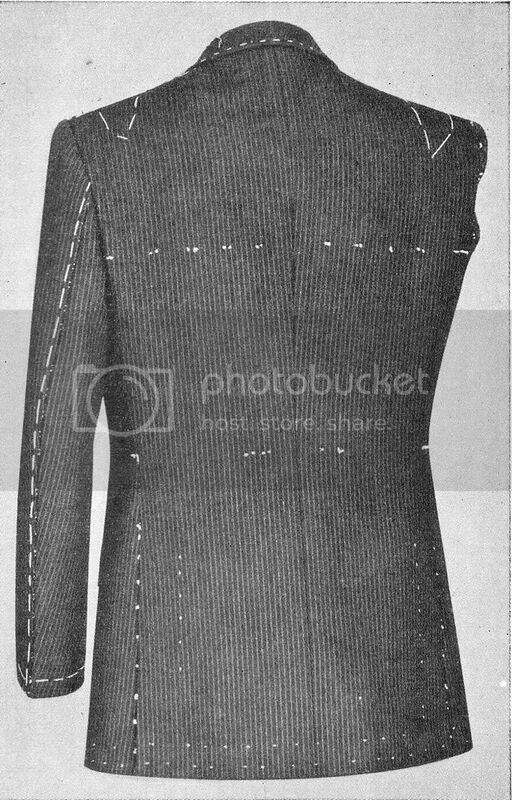 0.75 cm seams have been allowed for, except at the centre back seam, the collar seam (back neck and gorge), the front and lower edges as well as the front dart. To attain greater fullness of chest, the pattern is cut in the following manner, which must be shrunk in by ironwork. It is easier to perform this pattern manipulation at the end. The cuts are opened up a maximum of 1 cm. Measure the length of a2 to Rb on the back panel. Determine length along the forepart of A2-At. These two lengths together form the height of shoulder seam. The armscye circumference is measured without seam allowances. 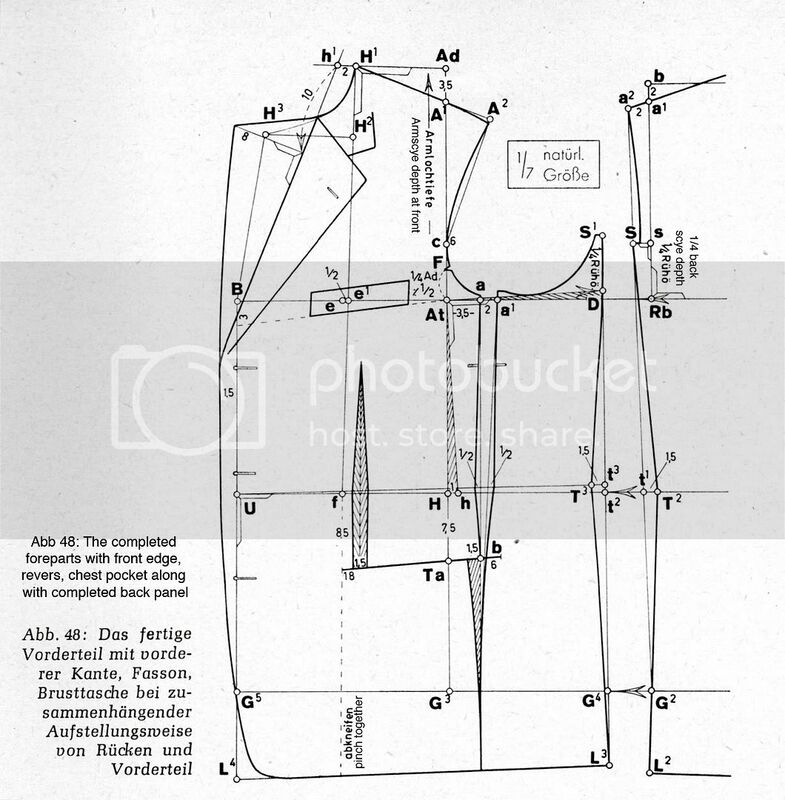 The next issue I have noticed with the Rundschau system is that the shoulder seam is a tiny bit slanted backwards. I find it best to complete the pattern according to the above system, and then move the outer tip of the shoulder seam a bit forward by 2cm or until it runs down the middle of the shoulder. Agreed in principle. It's better IMO to complete the draft using whatever system you prefer, then slice into the 1st pattern in order to make adjustments for posture, dart manipulation or seam placement before transferring to oaktag. I say this because you need to notice a pattern for how well the system works for you (the 80/20 principle) and how to codify changes to make it your own. I happen to like the shoulder seam diminishing to the back. But, I have no sound argument why it can't be adjusted to the center of the shoulder. Of course, if you cut a wide seam allowance on the shoulder seam, you have the option to change the seam placement during the baste fitting. RE: back neck. It could also depend on the style. 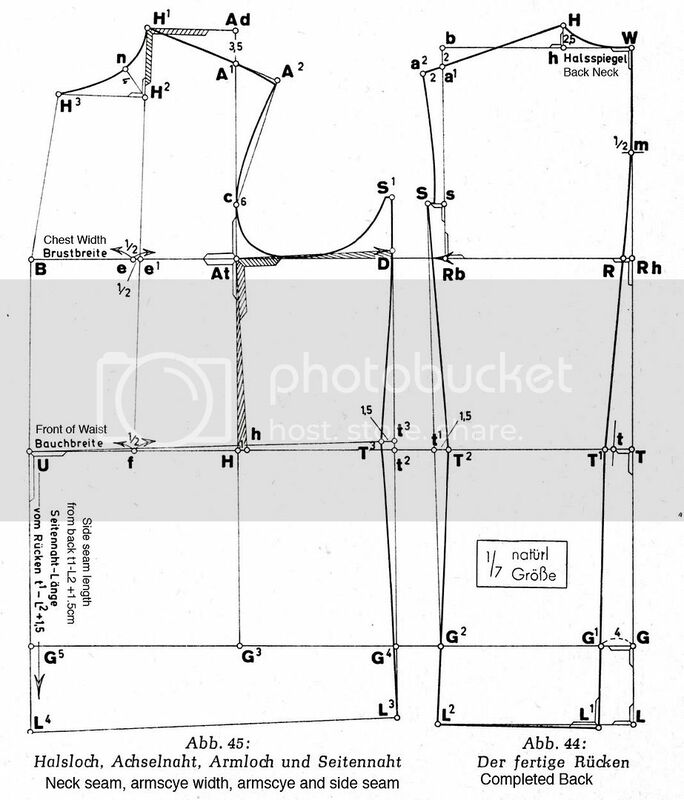 If cutting a drapi-er style, I use a formula of 1/6 neckline + 5/8" as opposed to a cleaner, English cut of 1/6 neckline + 1/4". Running twill tape around the neckline can shrink/reduce the neckline to accept the undercollar, which also creates room for a rounded upper back, slightly broader shoulders or just a well-distributed drape across the back panels. In the first example the arm scye is ok. I measured it with 17cm - 2cm = 15cm which is for a a chest girth of 96cm. I scaled the pic in photoshop and measured it. Edited by Der Zuschneider, 24 November 2009 - 09:58 AM. Some proportant systems work for certain sizes. Like a 36 inch chest will give a armhole depth of so much. But, a person with a 56 inche chest the proportant systems mehtod does not work creating a deep armhole, way to far down and maybe way to wide. Some systems work great, but you need to know when to depart it and use another system or a side system to depart where errors would be made. Poulins book has a chart for the different sizes of chest, but a steep shouldered or flat shouldered person may need a different height. Measureing on the person maybe the best method. There are several ways to do this. One method is to push to rullers up into the armpit as high as comfortable and then put a yard stick across the top, then measure from nape to bottom of yard stick. 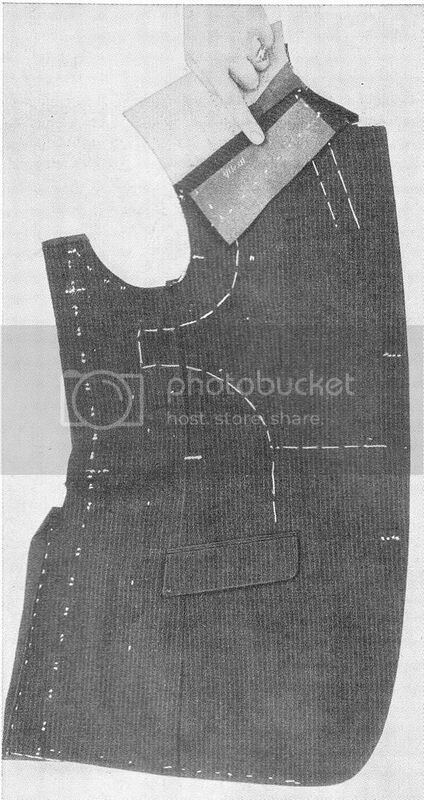 The proportant system could put the armhole down to the waist on a short person with a 50 inch chest, which would be a cutting diasaster. Seeing with the eyes what a person is can be far more important than the numbers from a tape measure. Good cutters develop good judgement. I have a question: e1 = e -0.5 cm. e1 makes the neck more crooked. How much can you subtract for a figure which much flesh over the bust and a belly? I subtracted 0.75 cm and opened the front with 1 cm. But still the pattern is not balanced. So should I open it more, should I subtract 1 cm from point e, or it is better to add at the Neck-Shoulder-Point, like it is shown here? Strong chest and belly is a nasty combination to deal with. I would suggest you start with one of the belly drafts (depending on the size of the belly) and add fullness to the chest later by opening the pattern on the Brustbreite line. 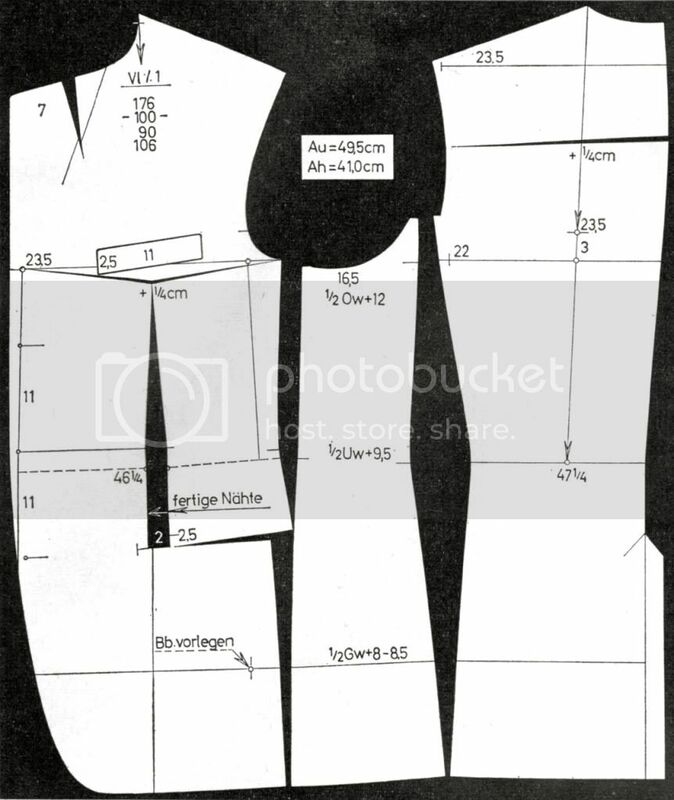 That draft and manipulation is shown in the Rundschau book starting on page 23 of the pdf (which is page 24 of the book)! Point f in the belly draft is a bit more forward, so by using the original point e1 the neckpoint will be more crooked. The discussion focuses on the underarm seam. They say that they are coming out of a period where lounge coats were cut wide and with little waist suppression. The side seam was according rather short. 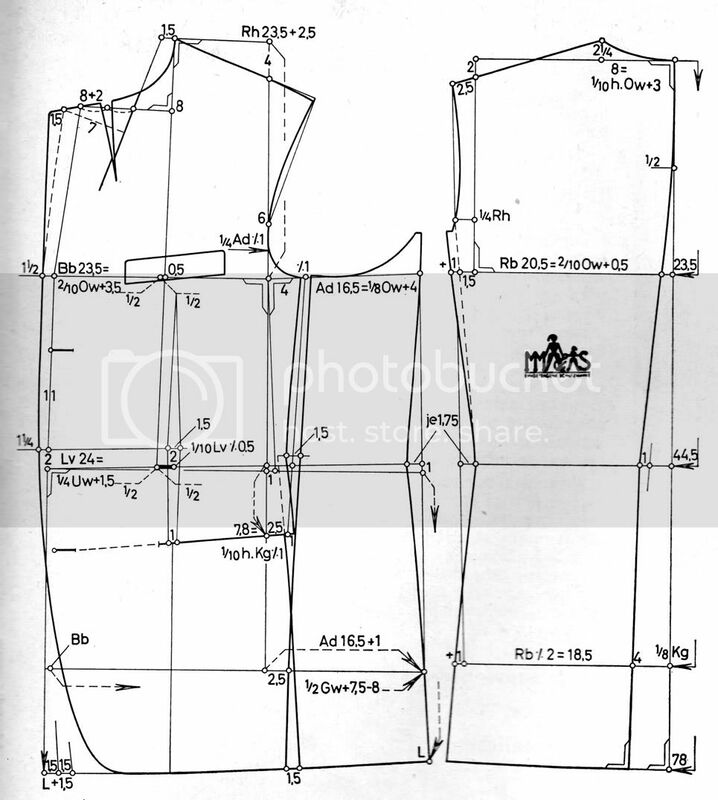 They used to take 2cm out of sideseam at the armscye (you will see this in the earlier draft show as 'minus 2' with the minus sign being like a % sign, except with full stops in the sign) and stretch the side seam on making up. For the more modern cut more length is need in the side seam. In the 1966 they take out only 1cm from the armscye area. If more waist suppression is required this can eliminated altogether. I just was reading it again, a very important topic. The line had changed massively and in the GDR the line was also changed in DSHW. Now you need to fully understand what that means having short and long side arm seams and the influence of the wedge hereby. I've decided to give a serious try to Rundschau, for a change, and used if for several projects. The system is good (actually, I had already incorporated several ideas from it to my own practice), but I always get coats with a lot of ease. I mean a lot (roughly twice what I usually put). There is no problem to correct that at fitting, the draft give a very easy to fit coat. But I wonder if I misunderstood something or if it is normal to get that much ease. If I understand correctly the story about long/short side seams, it seems normal... I'll have to change the formula if it is the case. 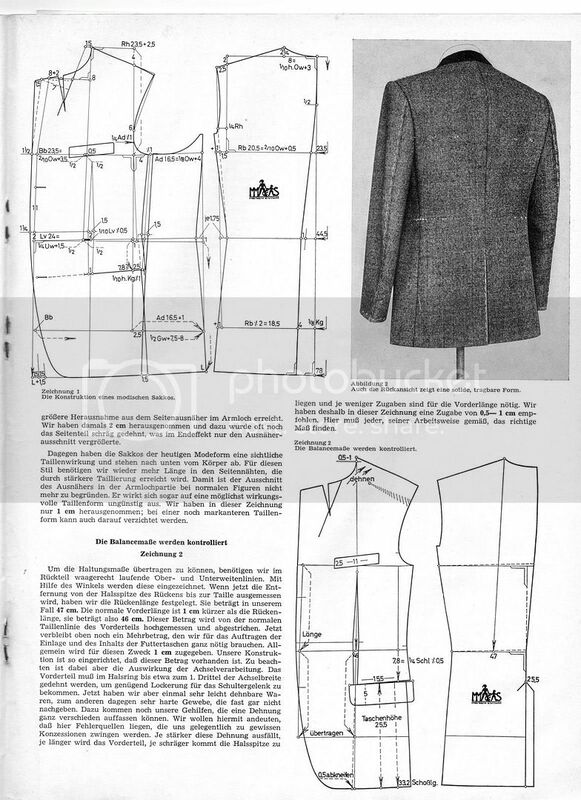 You can adjust the ease of a Rundschau coat to your likes by simply adding less to the different formulas. As we found out, the RS coat has quite a wide scye, so instead of adding 3-4cm to the body measurement (or the 1/8 chest) you could use 2-3cm. Same with the chest width formula. All the other construction points will follow. Thanks, SG. That is precisely what I've started to do, and this is what I like best in Rundschau : the way it is so easy to manage precisely where we put ease, and how much. Other systems can do it all rigth, but I find Rundschau more clear for this matter. I loved getting in depth with it after reading Ostinelli, and find some details that have definitive Ostinelli flavour, as the fact that the base of scye is not horizontal. 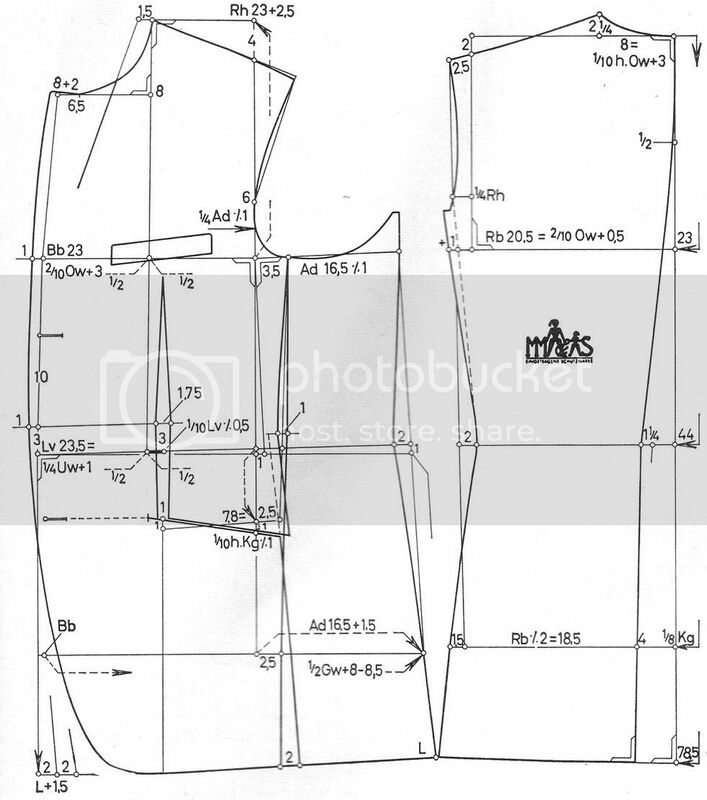 chest = 93 cm, waist = 79 cm; chest width = chest girth/5 + 3,5 cm = 22,1 cm, front waist = waist girth / 4 = 19,7 cm. 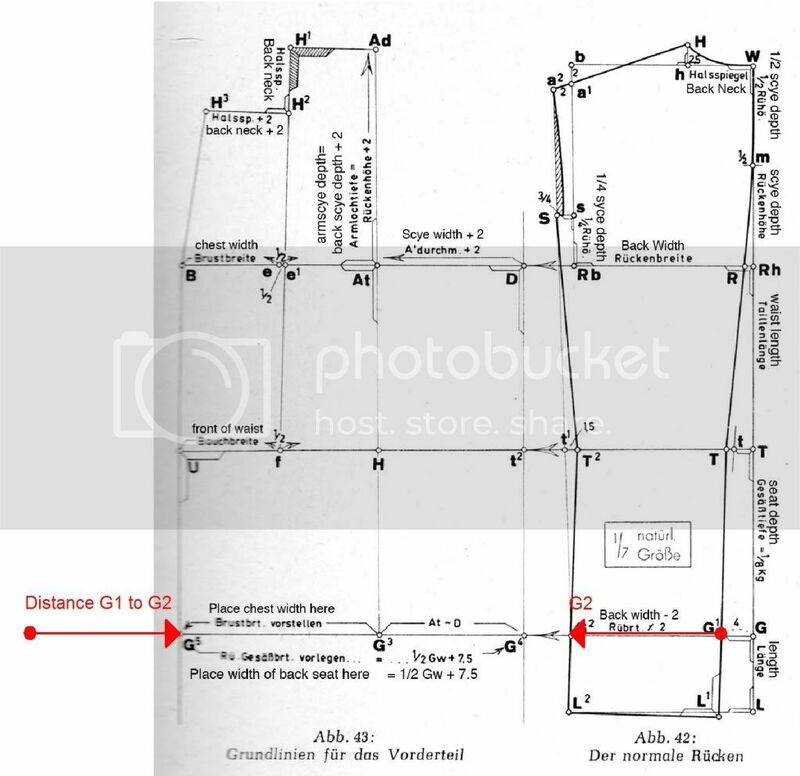 I can't square down from U, cause the point G5 by placing the chest width from G3 to G5 is 22,1-19,7=2,4 cm lefter than can be by squaring down from U. Can anybody explain this please? There is something unclear to me. It appears the line G5, G3 and G4 is overdefined? The points G3 and G4 are givens, whereas G5 is an extension of G3 by the chest width. But what to make of remarks like "Rü.-Gesäßbrt. vorlegen...=...0.5Gw+7.5" and "At-D"? You measure from G3: To the left it's the back hip width plus the front chest width. To the right it's At to D (scye width).